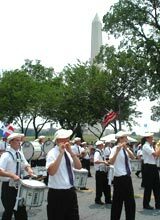 If you're interested in entering your band in the National Memorial Day Parade, please request an application from Music Celebrations at the contact info above. The National Memorial Day Parade in Washington, D.C. pays tribute to the pride, sacrifice and service of America's Veterans. Memorial Day, which was originally known as Decoration Day, has a history stretching back to the Civil War and serves as an important reminder of those who died in the service of their country. The three-hour parade passes alongside the National Mall on Constitution Avenue between 7th and 17th Streets. The event is a magnificent salute to America's Veterans and in honor of those who died in defense of our country  from the American Revolution to Operation Iraqi Freedom. The parade consists of outstanding marching bands from many of the 50 states and veterans units honoring World War I, War World II, The Korean and Vietnam Conflicts, Desert Storm, and the liberation of Grenada, Panama, Iraq and Afghanistan. Large patriotic floats and helium-filled balloons are also part of procession. More than 10,000 participants take part in the parade annually. The National Memorial Day Parade is streamed live on YouTube and at www.military.com beginning at 2:00 PM Eastern. The parade is also televised live on local stations nationwide, around the world on the American Forces Network, and locally in Washington, DC on News Channel 8. • Sightseeing tours of the Capitol Hill area, the Supreme Court Building and the Library of Congress. • A "War Memorial" walking tour of the Lincoln, Korean, World War II, Franklin Delano Roosevelt, and Vietnam Memorials. • Visits to historic Mount Vernon, Old Towne Alexandria, Ford's Theater and the Peterson House (where Lincoln died). • Attending the National Memorial Day Concert on the West Lawn of the U.S. Capitol, featuring the National Symphony Orchestra broadcast live on PBS.